^ 其出生年份有爭議。在Robert Carter《The Chronology of St. John Chrysostom's Early Life》一書中，在Traditio段落 18:357–64 (1962)，Jean Dumortier, 《La valeur historique du dialogue de Palladius et la chronologie de saint Jean Chrysostome》一書中，在Mélanges de science religieuse段落, 8:51–56 (1951)都有相關討段落。Carter將他出生的年份定在西元349年，也可以參考Robert Louis Wilken的《John Chrysostom and the Jews: Rhetoric and Reality in the Late Fourth Century》 (Berkeley: University of California Press:1983), p.5. 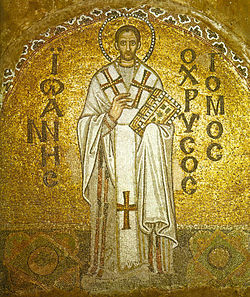 ^ 2.0 2.1 "St John Chrysostom" in the Catholic Encyclopedia, available online. Retrieved March 20, 2007. ^ 4.0 4.1 Catholic-forum.com 互联网档案馆的存檔，存档日期2008-01-17. ^ 若望實際出生的年份仍在討論，一般會認為是在公元344至349之間，也有認為是在公元340年至350年之間的(Kelly 296)。在目前最近出現的金口若望一般生平中，著名學者教父JND Kelly（英语：JND Kelly）在確認相關證據及文獻後，認為公元349年是最符合所有證據的年份，和Robert Carter認為的一致。參見Kelly, Golden Mouth: The Story of John Chrysostom: Ascetic, Preacher, Bishop, (Grand Rapids: Baker Academic, 1998: originally published Ithaca: Cornell University Press, 1995) p. 4 fn. 12; esp. 296–298 passim。若要看有關其早年生平重建的concurring analysis，可以參考Robert Carter, "The Chronology of St. John Chrysostom's Early Life", in Traditio 18:357–64 (1962)。若要看古期文獻的其他觀點討論，可以參考G. Ettlinger, Traditio 16 (1960) 373–80, Jean Dumortier, "La valeur historique du dialogue de Palladius et la chronologie de saint Jean Chrysostome", in Mélanges de science religieuse, 8:51–56 (1951). 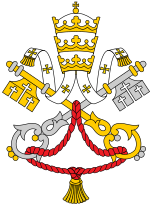 ^ Pope John Paul II. Letter to the Ecumenical Patriarch of Constantinople, His Holiness Bartholomew I. [30 March 2007].